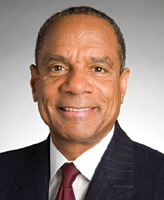 While ascending the executive ranks of the American Express Corp. since 1981, Kenneth I. Chenault, chairman and CEO, was named Corporate Executive of the Year by Black Enterprise and a Top 25 Manager by BusinessWeek, among other management distinctions praising his trailblazing leadership accomplishments. Mr. Chenault will bring his insights and experience to the Kellogg School when he delivers the annual Convocation address to an expected 1,000 MBA graduates on June 17 in Northwestern University's Welsh-Ryan Arena. He holds a juris doctorate from Harvard Law School and a bachelor's degree in history from Bowdoin College. His previous roles at American Express include director of strategic planning, vice chairman and president. At the Kellogg School's EMBA convocation in December, Edward Zander, CEO of Motorola, shared his perspectives on leading the $32 billion corporation and its 68,000 employees.